The title rhymes! :0) I made Sticky Buns a while back and wanted to try something a bit different. Strawberries are on sale right now at Whole Foods so I picked some up and thought I would try making my own fresh strawberry preserves/sauce with a twist. 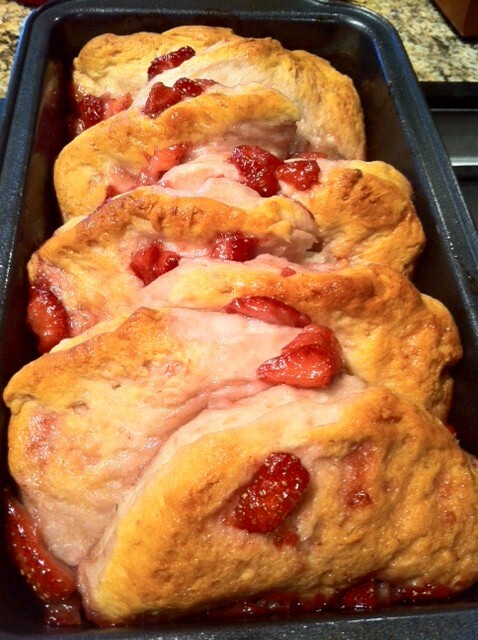 Strawberries in the sauce pan with sugar. 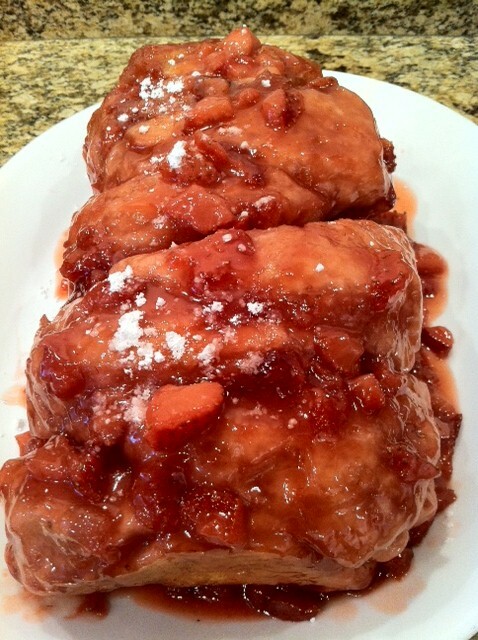 This past Sunday, Maggie showed up at our door extra early….so while Mark slept-in (and Maggie vegged out on the couch), I made them both Strawberry & Rum Sticky Buns! 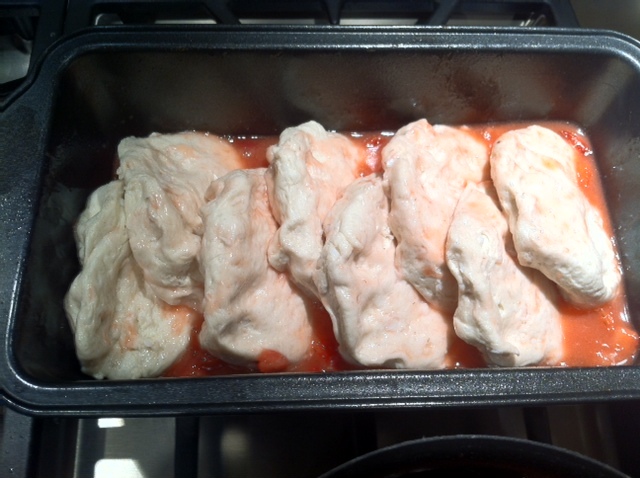 Preheat the oven for 350 degrees and prepare a loaf pan- I used PAM. 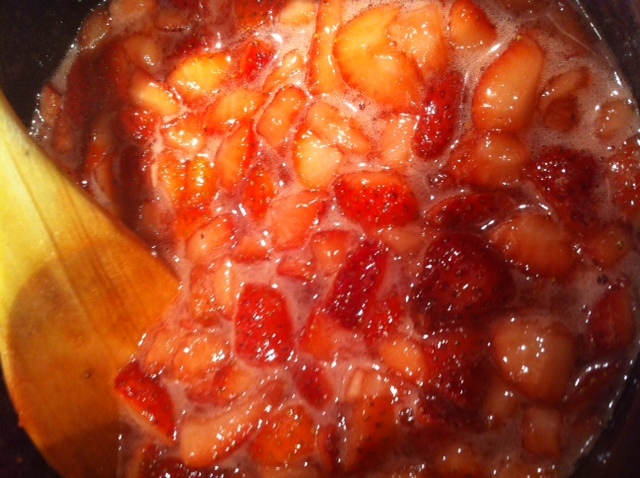 Bring the strawberries to a boil then reduce to simmer. 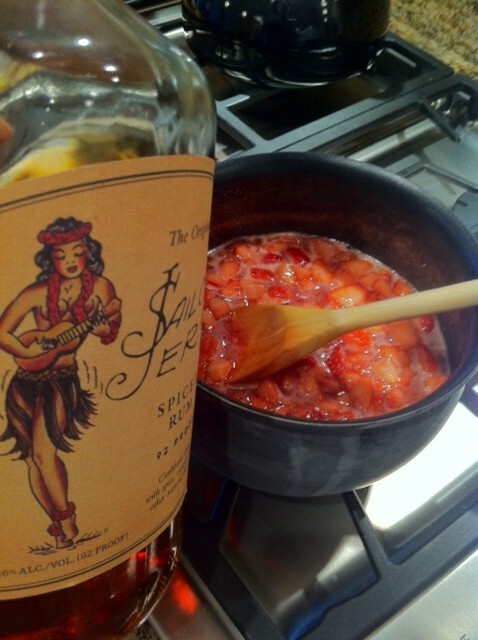 Add the Sailor Jerry’s Spice Rum, bring to a boil again and then reduce to a simmer until the mixture thickens….the strawberries hold a lot of moisture so this can take up to 20-25 minutes depending on how high your heat is. You will want to stir consistently. 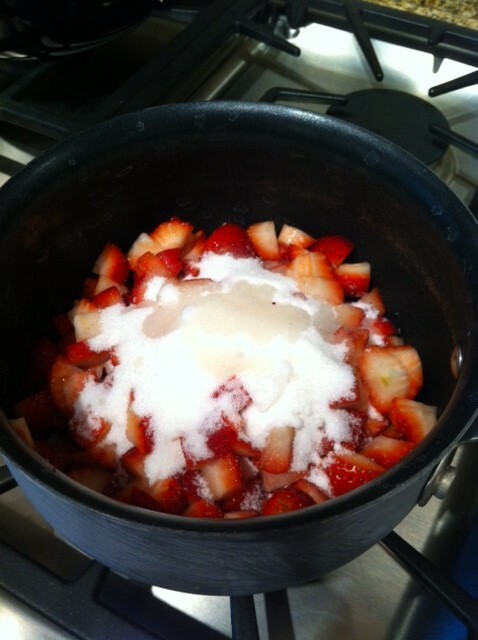 When the mixture thickens and the strawberry pieces start to shrink/dissapear, add the butter. Let it melt while stirring. Stagger the biscuits in the loaf pan. And pour the remaining mixture on top. Then pour the remaining mixture over the biscuits. If you find that you have a lot of sauce left, pour it in a jar for future use…Strawberry Jam/Butter- great for toast! Pop them in the oven for about 25 minutes or until golden brown on top. Remove and let it cool for about 5 minutes…then flip the pan over on a plate and sprinkle with a little powdered sugar for presentation! Let cool for 5 minutes. Flip the loaf pan over, onto a plate. And sprinkle powdered sugar on top. Was the perfect Sunday morning treat and great with coffee!